On Thursday 26th April a cheque for £683 was collected by Claire Larkin from the charity With Kids. This sum was collected as part of our work towards the UNICEF Rights Respecting Schools Gold Award. 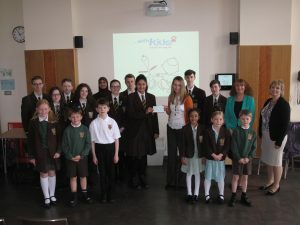 In the week before Easter we undertook fundraising in aid of organisations working to alleviate child poverty, which was a theme chosen by the pupils. With Kids was chosen by a pupil vote in Primary and Secondary and was selected as funds would be used locally. With Kids is a charity that uses play therapy for children who have suffered a traumatic event or experience difficult circumstances. Their aim being to ensure that these circumstances do not impede the child’s life chances and to offer a long-term strategy for alleviating child poverty.